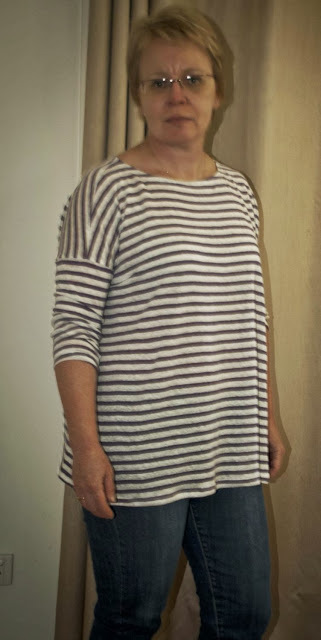 Another free download pattern from Tessuti - the Mandy Boat Neck Tee This pattern seems to be a step ahead of the Fave Top - the pattern can be printed at copy shop or home printer size and (lucky me) has access to a plan printer. The instructions are also more detailed than the instructions for the Fave top. This top uses a lot less fabric than the Fave top but I think I still prefer the Fave top's shape. However I do believe this top will get lots of rotation through the wardrobe too. The fabric is a linen jersey bought from The Fabric Store. The fabric is divine to wear and work with, except after washing it skewed a bit (BTW - the Fabric Store do recommend dry cleaning, but I am too cheap to do that for an everyday wear top) so I had trouble getting the stripes to play nicely. I mostly got matching except on one shoulder. A quick sewing fix that gives a casual top with modern styling. What's not to like?? What's not to like indeed - love it. I think it will be a real winner for you this hot summer. I like the look and shape of that top on you... I downloaded it too. Lucky to have access to the plan printer. I hate sticking patterns together. I think that fabric is the same as the one I made a burda top from (but in a navy) and agreed it feels lovely but skews. Looks like a great top for the summer. The stripes work really well. 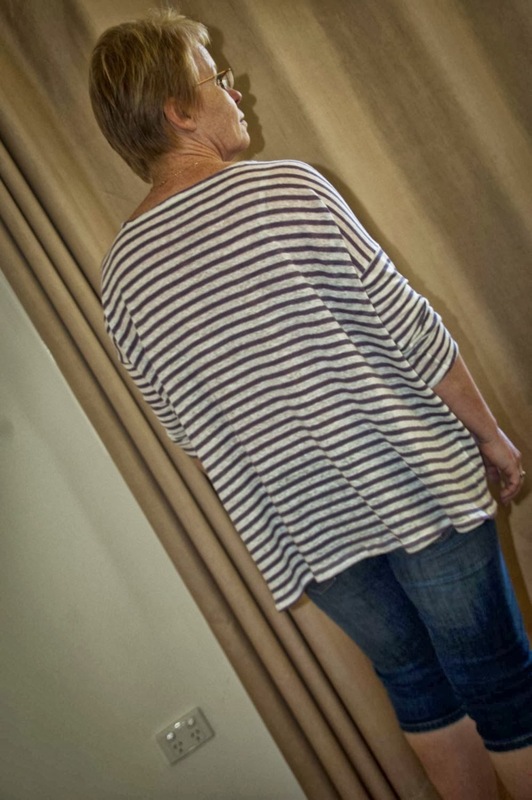 Perfect top for the coming summer months and love the stripes. 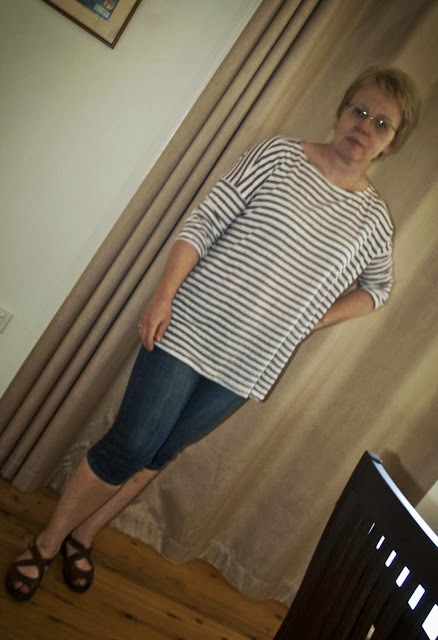 Thank you Sue for your review on the Mandy Boat Tee and The Fave Top! They both look fantastic. You'll be pleased to know that I have since updated the Fave Top pattern, with more detailing on the actual pattern and it also includes more indepth sewing instructions like the rest of our patterns. The Fave Top was our first ever pattern and was done a few years ago.It's still a favourite! Both great patterns and I thank you for providing them for us. Good to hear about the Fave top instructions. I had no problems but as it is such a great pattern it is a good one for less experienced sewist's - so great that they can enjoy this pattern now! I will be trying your pants patterns next - looking forward to it!